Biologists and wildlife officials hope to wipe out feral hogs — which are simply domestic stock turned wild — because they tear up wetlands, kill native vegetation and eat the eggs of turtles and ground-nesting birds. Farmers detest them because they destroy fences, root up crops and harbor livestock diseases. The only people who admire wild pigs are hunters. Ancient Romans considered the wild boar noble quarry because it was elusive and fought fiercely when cornered, and today’s feral pigs have those same qualities. That description sounds very much like the White Sow and other wild pigs described in Diana Gabaldon's books, doesn't it? My interview in the July 2011 issue of RT Book Reviews Magazine. That was totally unexpected, and I'm delighted that the article turned out so well. 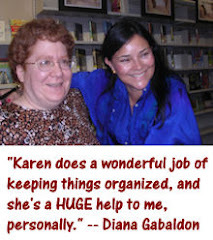 The OUTLANDER 20th Anniversary Contest, which was a tremendous success, and led to Diana Gabaldon's first-ever comment on this blog. I was supposed to be flying up to New Jersey today for a big family get-together at my cousin's house over the weekend, but "due to Hurricane Irene's insistence on crashing this weekend's party", as my cousin put it, the whole thing has been cancelled. I'm disappointed that I won't get to see everyone, but relieved not to have to travel in that mess! 1) As bad as it is to experience a hurricane on land, I think it would be much worse in a tiny wooden sailboat on the ocean. I was sitting on the deck, legs splayed, with the mast at my back and the line passed around my chest. The sky had gone lead-gray on one side, a deep, lucent green on the other, and lightning was striking at random over the surface of the sea, bright jags of brilliance across the dark. The wind was so loud that even the thunderclaps reached us only now and then, as muffled booms, like ships' guns firing at a distance. Then a bolt crashed down beside the ship, lightning and thunder together, close enough to hear the hiss of boiling water in the ringing aftermath of the thunderclap. The sharp reek of ozone flooded the air. 2) Can you imagine being caught outside in a storm like the one Claire found herself in? I would have been terrified. Sheet lightning shimmered far away, across the mountains. Then more bolts, sizzling across the sky, each succeeded by a louder roll of thunder. The hailstorm passed, and the rain resumed, pelting down as hard as ever. The valley below disappeared in cloud and mist, but the lightning lit the stark mountain ridges like bones on an X ray. "One hippopotamus, two hippopotamus, three hippopotamus, four hippopot--" BWOOOM! The horse jerked and stamped nervously. "I know just how you feel," I told it, peering down the valley. 3) Thank God, all storms come to an end sooner or later! I remember all too well the eerie quiet the morning after Hurricane Fran came through Raleigh in 1996, leaving us without power or phone service for several days. Then I woke, to find the wind a little quieter. The seas still heaved, and the tiny boat pitched like a cockleshell, throwing us up and dropping us with stomach-churning regularity. But the noise was less; I could hear, when MacGregor shouted to Ian to pass a cup of water. The men's faces were chapped and raw, their lips cracked to bleeding by the whistling wind, but they were smiling. "It's gone by." Jamie's voice was low and husky in my ear, rusted by weather. "The storm's past." It was; there were breaks in the lead-gray sky, and small flashes of a pale, fresh blue. I thought it must be early morning, sometime just past dawn, but couldn't tell for sure. It had been raining for days, and the footing was uncertain, slippery and boggy by turns. The wind was high, and the storm surge pounded the beaches; they could hear it, even in the secluded spot where the portal lay. "We were all scared--maybe all but Rob--but it was way exciting, man," he said, beginning to show a glimmer of enthusiasm. "The trees were just about layin' down flat, and the sky, it was green. The wind was so bad, you could taste salt, all the time, because little bits of ocean were flying through the air, mixed with the rain. We were, like, soaked through to our choners." Good luck to everyone who's affected by Irene! Those of you who have seen Diana Gabaldon's recent blog post about the Fergus Scottish Festival may recall her comment about "the excerpt that made a tent full of two hundred people gasp out loud". As many of you know, I'm an excerpt-avoider, and have been since 2008. When the subject of this particular excerpt came up on Compuserve a few days ago, Diana told me, "Oh, believe me; you don't wanna know. <g>"
And indeed I don't. I'm determined not to peek at this or any other excerpts from Book 8. But I thought the rest of you would want to know that Diana has now posted what appears to be the same excerpt that got such a reaction at Fergus. The link to the discussion on Compuserve is here. 1) PLEASE DO NOT DISCUSS THE DETAILS OF THIS EXCERPT HERE ON MY BLOG! Don't quote from it, don't refer to anything that happens in it, and please, please don't spoil it for me! Thank you. 2) The same applies to the Outlandish Observations page on Facebook. Again, thank you in advance for not spoiling it for me. 3) If you want to discuss this excerpt, you can post in the discussion on Compuserve, or on the LOL Excerpt Board. Just please don't talk about it here, or on my Facebook page, even with spoiler space! Diana says I don't want to know yet, and I take her at her word. But for the rest of you....enjoy! I found out today that the DOWN THESE STRANGE STREETS anthology, containing Diana Gabaldon's novella, "Lord John and the Plague of Zombies", is not scheduled for release in the UK until November 17, 2011, a full six weeks after its October 4th release date in the US and elsewhere! Order a signed copy from the Poisoned Pen bookstore, in Scottsdale, Arizona. This is Diana Gabaldon's local bookstore, and they ship all over the world. Their staff is very friendly and knowledgeable about Diana's books. Check online sites such as the Book Depository, which will ship to UK residents. I'm told that amazon.de (the German Amazon site) is also a good resource for shipping (English-language) books to the UK. Even if you don't speak German, the site seems reasonably easy to navigate. You can pre-order DOWN THESE STRANGE STREETS here. Please help get the word out to anyone you know in the UK who may be interested. Thanks! For more information about DOWN THESE STRANGE STREETS and "Plague of Zombies", look here. Here's a selection of pictures and links related to 18th century clothing. I hope you enjoy them! 1) Here's a video showing how people dressed in Colonial Virginia, featuring re-enactors from the Claude Moore Colonial Farm. After you've watched the video, you can see how much you recall, by playing Dress The Part. This is an interactive little game that lets you explore how various members of 18th century society dressed, and in what order they put on the various items of clothing. Give it a try; it's not nearly as easy as it looks! I turned my back gratefully to him. With expertise born of long experience, he had the lacing of my stays undone in seconds. I sighed deeply as they loosened and fell. He plucked the shift away from my body, massaging my ribs where the boning had pressed the damp fabric into my skin. 5) Here's an example of French court fashion from around the same time that Jamie and Claire were in Paris in DRAGONFLY. This is a portrait of Madame Pompadour (mistress of Louis XV), dated 1748-1755, by Maurice Quentin de la Tour. 7) The portrait above shows John Murray, 4th Earl of Dunmore (painted by Joshua Reynolds, 1765), wearing the uniform of one of the Highland Regiments. This was during the period when the Diskilting Act barred Highlanders--with the exception of those in the Highland Regiments--from wearing their native dress. 8) I can't resist including this 1749 painting by William Mosman, featuring two young Scottish boys (Sir James MacDonald and Sir Alexander MacDonald). Every time I look at it, I think of Ellen's portrait of Jamie and Willie. 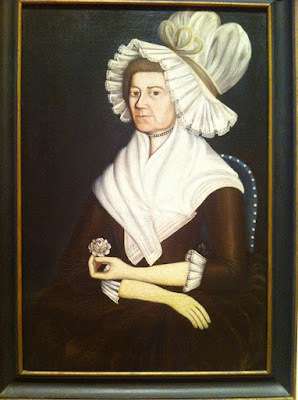 9) I think the mobcap shown above looks just like the one that Claire received from Grannie Bacon in FIERY CROSS. To modern eyes, it's pretty hideous, and I have no trouble understanding why Claire got upset. "Grannie Bacon's sent ye a present," she explained proudly, as I unfolded the material, which proved to be an enormous mobcap, liberally embellished with lace and trimmed with lavender ribbons. "She couldna come to the Gathering this year, but she said as we must bring ye this, and give ye her thanks for the medicine ye sent for her...roo-mah-tics." She pronounced the word carefully, her face screwed up in concentration, then relaxed, beaming in pride at having gotten it out properly. "Why, thank you. How lovely!" I held the cap up to admire, privately thinking a few choice things about Grannie Bacon. For more examples of 18th century clothing, take a look at Jas. Townsend & Son, Inc.. This site has a large variety of 18th century colonial items for sale, including clothing, shoes, and accessories, for all ages. I like to browse through their online catalog, just looking at the pictures. I also like the Colonial Williamsburg site very much. Lots of interesting information there, on women's clothing, men's clothing, and much more! If you want to see more of this sort of thing, I would highly recommend a book that I bought at Colonial Williamsburg in Virginia when I visited there in 2008: EIGHTEENTH CENTURY CLOTHING AT WILLIAMSBURG. Here's an article I found yesterday about Diana's appearance at the Fergus Scottish Festival in Ontario this past weekend. A very nice piece, focused more on the fans than on Diana herself. [Diana's reading of excerpts] led to one of the more amusing moments of the day, sending one young woman running from the tent with her hands over her ears yelling “I haven’t read that one yet!" Inspired by that list, I thought I'd ask: What is your favorite closing line from the OUTLANDER books? My sentimental favorite is the one from FIERY CROSS, of course, but I like the ending lines of OUTLANDER and DRUMS almost as much. What about the rest of you? 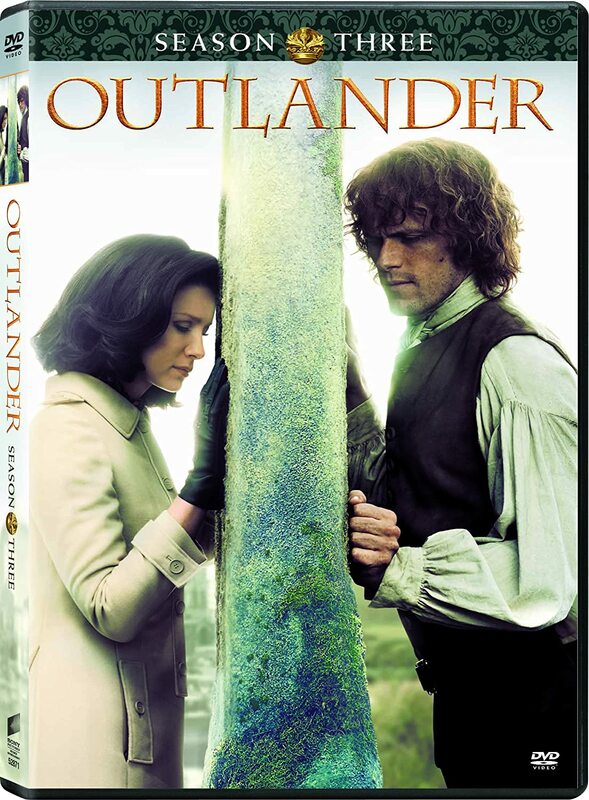 The OUTLANDER and Lord John books will be available on Kindle in Australia on August 31! This is great news for Australian Kindle-owners. Thanks, Rainyfly, for letting us know -- and also for your persistence in contacting Random House to ask when the books would be available on Kindle in Australia. Whether or not the change was due to the influence of Australian fans writing the publisher to complain, I'm glad they were able to get it resolved. Please pass this on to anyone you know who may be interested. 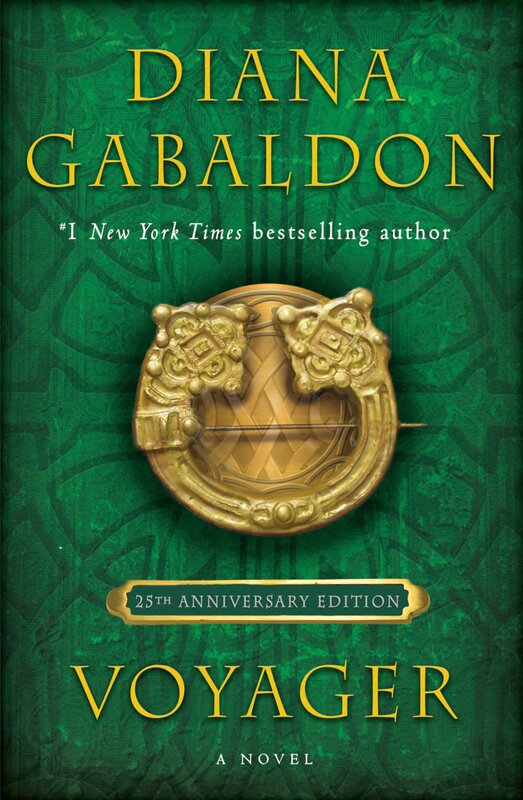 How long have you been reading Diana Gabaldon's books? 0.93% - Since she first started posting excerpts on Compuserve, before OUTLANDER was published. 0.55% - I don't remember. 0.55% - I haven't yet read any of Diana Gabaldon's books. There were 538 responses to this poll, which I think is just phenomenal! I hope the new poll format is working better for you. I didn't vote in the poll myself, but I fall into the first category. It will be five years for me in November. Please take a moment to vote in the August poll. 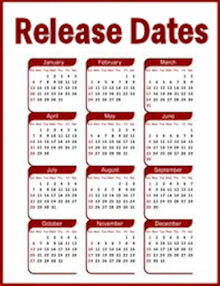 With "Lord John and the Plague of Zombies" due out October 4, and THE SCOTTISH PRISONER on November 29, I thought this might be a good time to revisit a poll topic that I first used in January, 2010: your opinions of the Lord John books and stories. All opinions, pro and con, welcome. If you think of an option I've left off this poll, please let me know.